Luxury two bedroom apartment, great location just 50 mtrs away from the elegant and very well known Patio Bullrich Shopping Center . 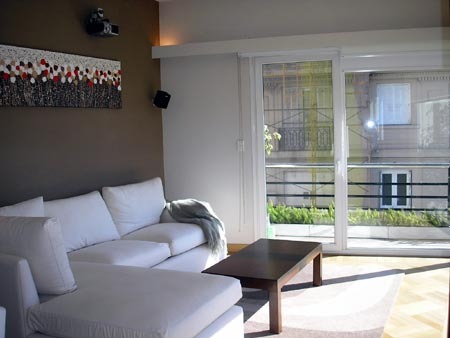 The apartment is sunny and bright with a balcony , the living room is very confortable , it has a film proyector with a large screen , dinning area with an elegant table with chairs . There is an open plan fully equipped kitchen with a glass breakfast bar with a LCD TV of "17".- The main bedroom is en suite with a double bed , walk in wardrobe and jacuzzi tub and it has a home theather and LCD TV "42".- The second bedroom has a double bed, WI-FI conection and a LCD TV "32" also there is a bathroom with shower. Highly recommended, a perfect place to stay in BA. Balcony. Full of natural light. A movie proyector, home theather plus Plasma of 42", LCD of 32",LCD of 17". An en suite bathroom with a large jacuzzi tub. Spectacular open plan kitchen. Fully equipped kitchen, washing and dry machine. Internet High Speed. A/C. Central Heating. City centre, Patio Bullrich Shopping Center, museums, cinemas, restaurants, art gallery, banks, residential area, commertial area. Parks, plaza. Included: Electricity, gas, water, building and city taxes, internet. Cleaning service twice per week .